I believe that through high expectations and clear, consistent procedures, a classroom can be engaging, exciting and a learning rich environment. Teaching is an art and I know I have the dedication, creativity and desire to reach all of my students. * I know that working and planning with others in a grade level is highly effective. * I am able to establish a safe, consistent environment for student learning. * I have learned leadership skills through various trainings and experience in the classroom. * I communicate well with students, parents, other staff and administration. * I am a life-long learner and enjoy learning anything new that will benefit students. * I plan creative and engaging lessons to keep learning excited. * Teaching ALL standards at a high level is something I expect of myself; integrating curriculum is so important. 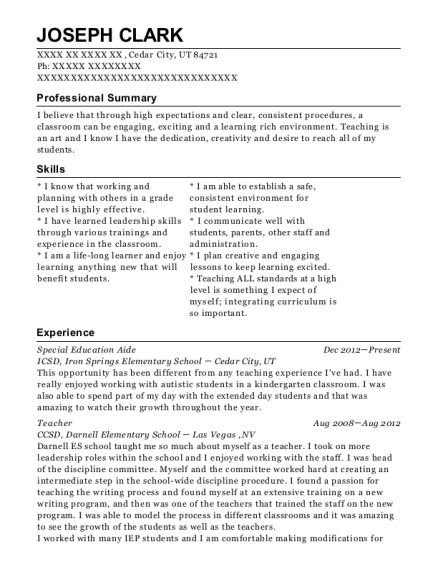 Special Education Aide Dec 2012－Present ICSD, Iron Springs Elementary School － Cedar City, UT This opportunity has been different from any teaching experience I've had. I have really enjoyed working with autistic students in a kindergarten classroom. I was also able to spend part of my day with the extended day students and that was amazing to watch their growth throughout the year. Darnell ES school taught me so much about myself as a teacher. I took on more leadership roles within the school and I enjoyed working with the staff. I was head of the discipline committee. Myself and the committee worked hard at creating an intermediate step in the school-wide discipline procedure. I found a passion for teaching the writing process and found myself at an extensive training on a new writing program, and then was one of the teachers that trained the staff on the new program. I was able to model the process in different classrooms and it was amazing to see the growth of the students as well as the teachers. I worked with many IEP students and I am comfortable making modifications for individual student needs. Teacher Aug 2001－Aug 2008 CCSD, Antonello Elementary School － Las Vegas , NV I taught at Antonello ES for 7 years and in that time I learned and gained so much experience. I am an effective communicator, both with students and parents. I participated in professional development training to improve my teaching so I am able to effectively reach all students with all types of learning styles. I learned in the years I taught at Antonello how important it is to have hands on learning. There is a place for worksheets and review, but most kids learn best when they can 'do' and not just 'hear about'. I enjoy being creative and getting to know my students as individuals. Teaching at this school taught me that high expectations can be reached by all students through hard work and a positive attitude in the classroom. 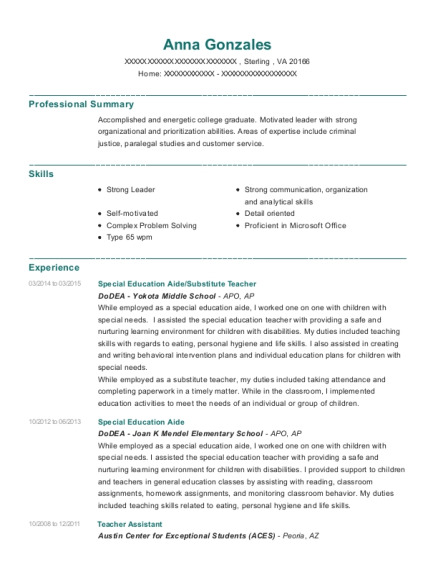 This is a resume for a Special Education Aide in Cedar City, Utah with experience working for such companies as ICSD and Iron Springs Elementary School. 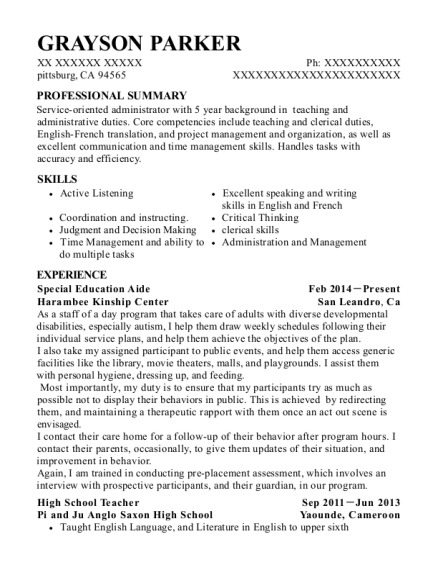 The grade for this resume is 0 and is one of hundreds of Special Education Aide resumes available on our site for free. 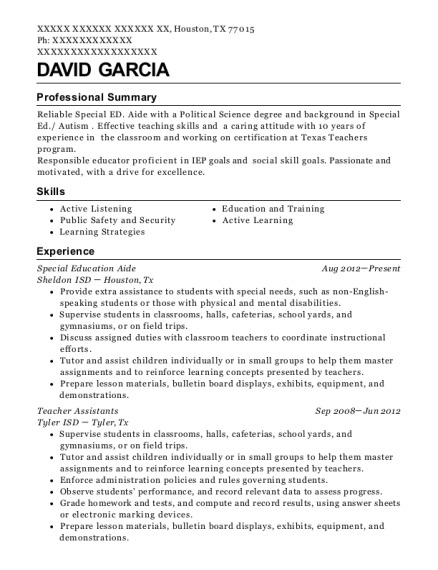 Use these resumes as templates to get help creating the best Special Education Aide resume.